Although every year again I disagree with the selection they’ve come up with, I nevertheless stay a fan of Het Theaterfestival, presenting the best theatre and dance performances of the past season in Belgium (and Holland). It always enables you to catch one or two performances all your friends have been talking about and you’ve nevertheless managed to miss. Such as Lisbeth Gruwez‘s It’s going to get worse and worse and worse, my friend, one of the performances kicking off this year’s edition at deSingel (Antwerp). Throw your body into the frontline. That’s the catchphrase for Lisbeth Gruwez’s company Voetvolk (infantry). And it is exactly what this experienced dancer/actress does in It’s going to get worse, a small gem of a performance. Gruwez used to be a dancer for Wim Vandekeybus and Jan Fabre. She was the girl dancing in olive oil in Fabre’s Quando l’uomo principale è una donna. She likes to describe herself as a wo-man; as in: there’s a man in every woman. And androgynous certainly is the word that springs to mind, when Gruwez walks on stage, into the light, in that rectangle she will not be leaving during the performance. Patent leather shoes, grey pants and slim white shirt (styling: Veronique Branquinho). Red lips, and her hair put up. Very slowly she starts moving. Her right hand and right arm first, repeating one simple movement again and again. Self assured, she’s looking at the audience. 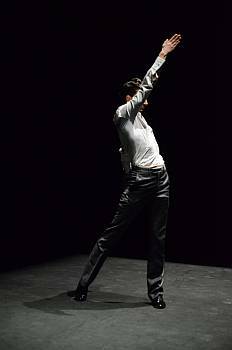 And from that one gesture the rest of the choreography – mainly focusing on the upper body – evolves. Real soon it becomes obvious that although Gruwez might be alone, there’s nevertheless another very strong presence on that scene too: the soundtrack – by Maarten Van Cauwenberghe – based on small fragments (repeated again and again, just as a dj/rapper would be scratching with a record) of a speech by Jimmy Swaggart. I’m not sure what exactly it is they’re trying to say, but it sure is a hell of a duet, Gruwez and her soundtrack. Mimicking it, and then going against it, in some sort of choreographic study of the art of speech. Halfway during the performance Gruwez pulls up her socks, thereby making that persona on stage even more ambiguous. Buster Keaton, one part of your brain is thinking, a Nazi or a toreador, the other part disagrees. Comedian or demonic manipulator? But one thing is sure: slowly but gradually she becomes more and more wrapped up in that speech/dance, a spellbinding performance finally coming to a halt with a scene based on Arvo Pärt‘s Fratres (music you might recognise from There will be blood). It’s going to get worse and worse and worse, my friend is a great, cleverly built-up, restrained performance, paying attention to every little detail. But in my opinion it could have done with just that little bit more. Something that would have lifted this from an impressive (preliminary) study to a performance that would really render one speechless. Or was I just expecting too much, due to all the great things I had heard? This entry was posted on August 29, 2012 at 12:32 and is filed under dance, theatre with tags Antwerpen, Arvo Pärt, deSingel, Jimmy Swaggart, Theatefestival, Voetvolk. You can follow any responses to this entry through the RSS 2.0 feed. You can leave a response, or trackback from your own site.